October 3, 2016. 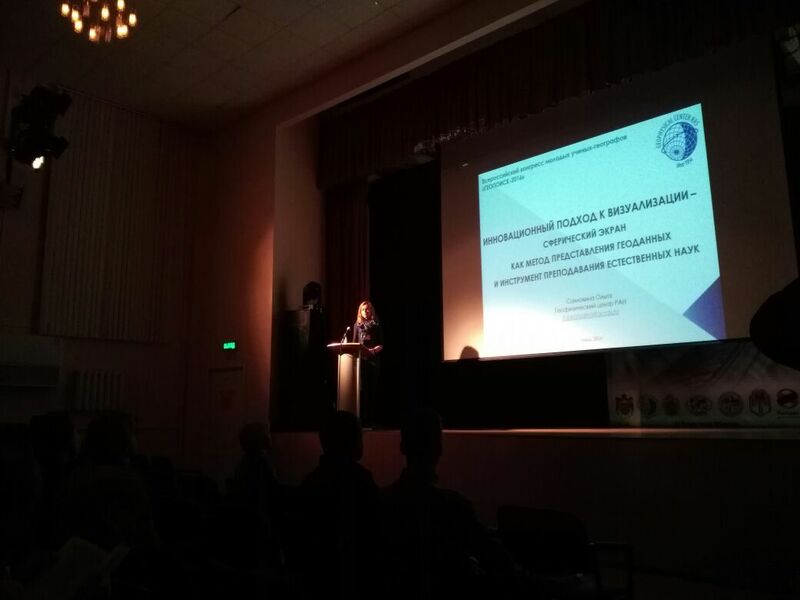 Congress of young geographers "GeoPoisk 2016" has opened in Tver. More than 200 representatives of Russian universities participated in the event. The Congress focused on two major geographic anniversaries - the 80th anniversary of the opening of the Tver State University, Faculty of Natural Sciences and Geography and the 70th anniversary of the creation of the regional branch of the Russian Geographical Society. The main objectives of the Congress are to promote scientific and educational projects involving young geographers, to identify and support talented researchers, promoting the development of national and international academic mobility of scientists and experts in the framework of development of a personnel reserve system and academic exchange. Research Fellow, Sector of innovative projects of GC RAS Olga Samokhina addressed the Congress on the topic "Innovative approach to visualization - spherical screen as a method of representation of geodata and tools of teaching natural sciences", and delivered a presentation of digital demonstration complex with a spherical projection screen. Her presentation aroused great interest among the students and teachers at the University.